NEW YORK (October 9, 2017) – FlightSafety International announces that its third full flight simulator for the Gulfstream G280™ aircraft will be installed at the company’s Learning Center in Savannah, Georgia. The simulator is scheduled to enter service in March 2018. The first two simulators for the Gulfstream G280 are located at FlightSafety’s Learning Center in Dallas, Texas. The G280 simulator will be equipped with a FlightSafety CrewView collimated glass mirror display. 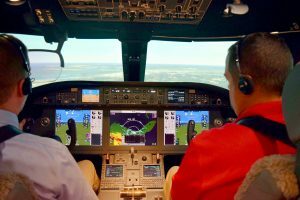 “This innovative new display will provide Gulfstream G280 pilots with an enhanced training experience that contributes to the realism FlightSafety’s FS1000 simulators deliver,” added Davenport. FlightSafety’s CrewView provides distortion-free optical performance with greater clarity, sharpness, and brightness for unprecedented simulation training fidelity. The glass technology provides a true spherical shape for exact geometry across the entire viewing area which eliminates the inherent distortion found in soft-film display systems. The simulator will also feature FlightSafety’s VITAL 1100 visual system. It significantly enhances training by providing highly detailed mission specific imagery with enhanced scene content and exceptional environmental effects. This includes continuous time of day, night, dawn/dusk and a comprehensive set of physics-based weather features that gives crew members the necessary cues to train for virtually any altitude and position. The simulator will be equipped with the Rockwell Collins Pro Line Fusion® PlaneView 280 avionics suite as well as a Head-up Guidance System with Enhanced Vision System; Dual flight management system with LPV and RNP capabilities; and Integrated Flight Information System. FlightSafety has been the official factory authorized training organization for Gulfstream Aerospace Corporation for more than four decades. Pilot, maintenance technician, and flight attendant training is offered for the complete line of Gulfstream aircraft using a fleet of 32 full flight simulators as well as other advanced training devices and equipment located at seven FlightSafety Learning Centers.